4% unlimited cash back for restaurant, dining and entertainment purchases is very good. Additionally 2% cash back to grocery purchases is awesome. You will not need to pay annual fee in first year. Regular fee is also very good for such a card. There is $500 bonus of the card and it is very attractive for consumers. There is no foreign transaction fee of the card. We always love cards which doesn't require you to pay extra for foreign transactions. Cash advance fee is low. Balance transfer fee is good. Card provides many good benefits to consumers. See some of those benefits below. There are high interest rates of the card for excellent credit score. However the card still very profitable despite of rates. Please see our Rewards/Interest Rate Balance compare below. Capital One Savor Rewards credit card is generally focused on purchases on dining and entertainment. The card is an awesome restaurant card for consumers because of high cash back rates. Besides it can be very useful for general usage too. We prepared a detailed review for you below about advantages and disadvantages of the card. Interest rates of the card is 16.74% or 22.24% or 25.74% and you can get this card if you have excellent credit score. It means while you are having very good credit score you can face with high interest rates with this card such as %25.74. Let’s think about the worst scenario and see if you can have any benefit from the card despite of high interest rate. Let’s Calculate Rewards + Interest Rate +Annual Fee of Capital One Savor Rewards Credit Card for a month. It seems if you even have the worst APR, you are going to have profit with Capital One Savor Rewards Credit Card. The situation can change if you cash advance or transfer balance. However these are actions which consumers do with their own decision. Besides 3% Cash Advance Fee and Balance Transfer Fee are very good rates for such cards with high cash back values. If the card had introductory APR for 12 months, your profit could be very high. However cash advance APR of the card is high. 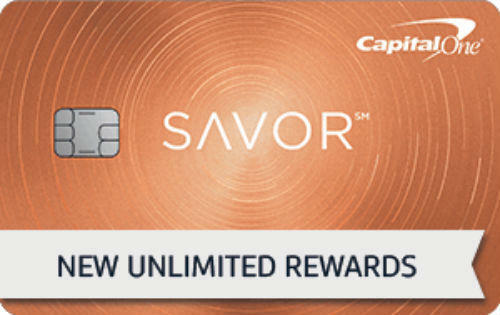 Capital One Savor Rewards Credit Card is a dining/restaurant and entertainment card. The card allows you to earn 4% unlimited cash back to these features and this is very good. Additionally for grocery purchases, you are going to earn 2%. Grocery purchases are important part of our expenditures. So additional 2% cash back for a general purchase category is a good opportunity for consumers. Besides your rewards will not ever expire in your credit card. $500 sign up cash back bonus is very good opportunity. At normal situation you can earn $500 cash back with $12500 worth dining/entertainment purchase. You will need to pay $95 annually one year later after your card is approved. First year is waived. 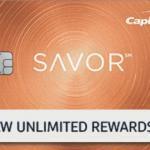 $95 annual fee is very good for Capital One Savor Rewards Credit Card. Cash Advance Fee and Balance Transfer Fee is very good with 3% rate. Similar credit cards are generally requiring 5% fee for those actions. This is creating much difference with them if you think about yearly transactions. You can save lots of money with those rates. There is no foreign transaction fee of the card. So you will not worry about purchasing at abroad or purchasing products online from abroad. This is especially very good when you travel abroad. You can see more at the official website. You can click on apply button above to go to Capital One Savor Rewards Credit Card page. You can see all rates and fees of the card below. There is also editor scores points of the card which has given with special & specific algorithm for each categories. Our team members liked the new card of Capital One. This is creative and consumer friendly credit card despite of high interest, you can earn with Capital One Savor Rewards Credit Card. Fees are also well-balanced for consumers. This is really a good work. If you have important amount expenditure for dining, restaurant and entertainment, we can recommend this card to you without any hesitation. If you also would like to get this card for general purchases, you will need to compare it with other opportunities very well. 16.74% or 22.24% or 25.74% 4% unlimited cash back on dining and entertainment purchases. Spend $3000 in three months from account opening, earn $500. $0 for the first year. You can find use reviews below for Capital One Savor Rewards Credit Card. Please don’t forget that user reviews are decisive at our card rankings. If you think that this card should get a better place or worse place in our rankings, please leave a review.